Though the degree to which hair can disgust is undoubtedly lessened by being mediated through photography or print, it nonetheless has a certain hold for me at least. I think it’s the connection with fairy tales and a sense that it’s in some way magical. I know nothing of spells at all apart from the opening lines of Macbeth but there’s hair right there, as far as I recall, so my mind makes that connection whether or not it would be borne out by, you know, actually looking stuff up. And of course, hair can stand in for the body. 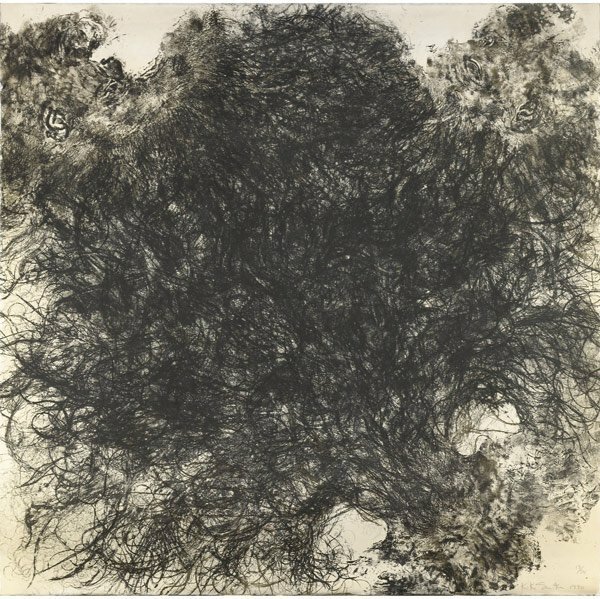 And in this lithograph by Kiki Smith, I think I’d argue that it stands in for both the artist and the process of recording in that the hair becomes a kind of drawing. Indeed, in this image the hair is Smith’s; the print is one of a folio of work in which Smith used imprints and photocopies of parts of her hair, face and neck as the basis for making prints. Moving from the hair to the skin, Smith used a 360º camera to record herself in order to make a print that shows the hair and skin as a flattened out image. Though the image can still be seen as a portrait in a way, the distortion disrupts the reading. The lake metaphor of the title, is reinforced by the way the top of the head becomes a horizon allowing the image to also be read as a landscape with the blue tinted skin as water. Though I think I’m often more interested in Smith’s sculptural work, there’s something compelling about the transformative way she makes images. In both these prints, the artist is representing herself but in both the image is very far from a traditional self-portrait and, to me, both suggest intriguing hidden narratives. 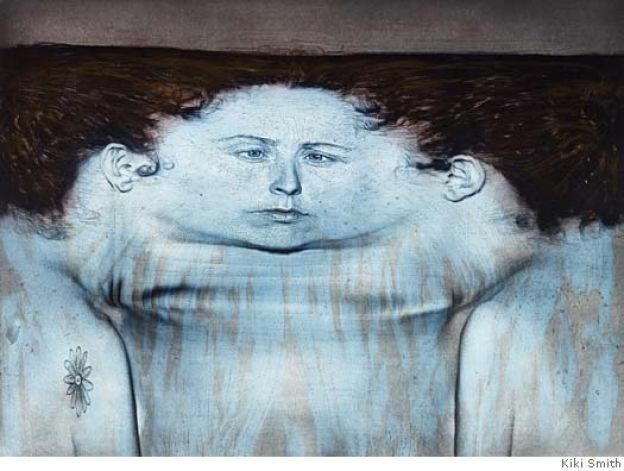 This entry was posted in Photography, Printmaking and tagged art, hair, Kiki Smith, lithography, My Blue Lake, photography, printmaking, Untitled (Hair) by Ann Jones. Bookmark the permalink.